Online Ticket sales have closed. Tickets are available at the door. Lui Collins: an intimate evening of song, accompanied on tenor ukulele and banjo. Folksinger/songwriter Lui Collins offers up an intimate evening of original songs, American standards & Brazilian bossa nova (in the original Portuguese), accompanied on tenor ukulele and banjo, and interspersed with stories and poems. Folk singer/songwriter Lui Collins has been performing, writing and recording for over 40 years, earning international acclaim for her music. 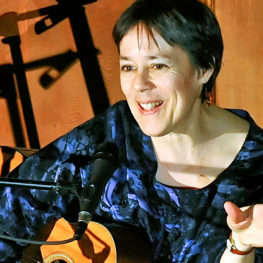 Her repertoire, accompanied on tenor ukulele and banjo, ranges from original and traditional folk songs and American standards to bossa nova in the original Brazilian Portuguese. She’s made 16 CDs, performed on others’ projects, and shared the stage with such folk-world notables as Tom Rush, Bonnie Raitt, and Stan Rogers. These days, along with creating playful 4-string arrangements of some favorite original songs, Lui has been exploring the fabulous jazz chords in old American standards and bossa nova on tenor ukulele. She also contributes to 3-part vocal harmonies and plays ukulele, banjo and clarinet with fiddler Donna Hébert and guitarist Max Cohen in the band 3 Ravens. In a parallel musical adventure, Collins founded Upside-Up Music and began teaching family music classes in 2003. She developed a primarily Kodály-based music curriculum for 5-7-year-old called Kids’ Jam, with 8 seasonal collections of recordings and songbooks. Her latest educational project has been adapting Kids’ Jam for use by homeschoolers and other families-at-a-distance, as Upside-Up’s Music at Home.